If you think your PC is slow, help is at hand. 360Amigo System Speedup is a new PC optimization and error repair utility that dramatically improves the performance of your PC. 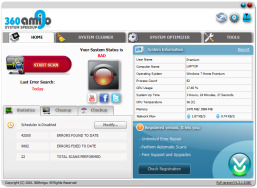 360Amigo System Speedup includes a System Cleaner, a System Optimizer, and a wide range of System Tools designed exclusively to boost PC performance. Both beginners and experienced users will enjoy the available features and options and the simple application interface. With the click of a button all common computer errors can be fixed. In a nutshell, 360Amigo System Speedup offers a Registry Cleaner to detect and remove all bad entries from the PC, it optimizes Windows for faster start-up times and stops runaway Processes that may take up all of the processors' cycles.